If you have a house that is older, aluminum painting is an exterior painting service your home may need. Aluminum siding is an older version of siding that has been around since the 1950s. It is often used as the outer protective shell of the home because it’s so lightweight. However, the downside is that aluminum oxidizes very easily, so the colors fade as it becomes chalky from the breakdown of the metal surface due to exposure to sunlight. 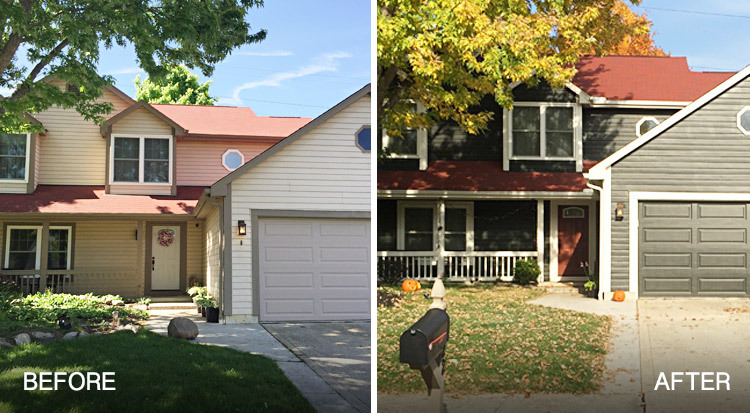 Homeowners often see fading, which leads to the colors becoming old and dull. Because of this, the colors tend to have a dated look, giving a worn-out appearance. The good thing about aluminum siding is that we can paint it any color you want with the proper prep work. This includes a good power wash with a tri-sodium phosphate and bleach solution that removes the chalking residue. Sharper Impressions has the knowledge and equipment to do this for you in a way that won’t ruin your home. Chalking can be found when you touch the paint surface and you have chalk left on the oils of your fingertips. If you try to paint over this on your own without the proper power wash, the paint will actually bubble, peel and fail within weeks. Instead of trying to do this on your own, Sharper Impressions will use the power washing techniques and equipment to repair your home correctly the first time. Once your home is power washed, it’s time to let the solution dry and apply two coats of a good acrylic latex paint. Sometimes we add Emulsa-Bond into the paint to give it flexibility and adhesion. As a result, your aluminum will last 10-15 years when painted properly. The best way to paint aluminum siding is with an airless sprayer that leaves a nice, smooth, factory-type finish of the new color on the aluminum siding and prevents any type of brush strokes or roller marks. We exclusively use these airless sprayers to give you flawless aluminum painting results. When your aluminum siding needs an update, Sharper Impressions Painting can prep it and give it a great factory finish that lasts. Looking for aluminum painting services to give your house a fresh look? Call Sharper Impressions Painting today to schedule a free estimate, or request a free quote by filling out the form below!